Durian and lychee farmers in Ba Ria Province in Vietnam cultivate bright, bold cacao in red ferrous soil and coastal air seasoned by East Sea. Expect a black current beginning and a bright candied orange finish. 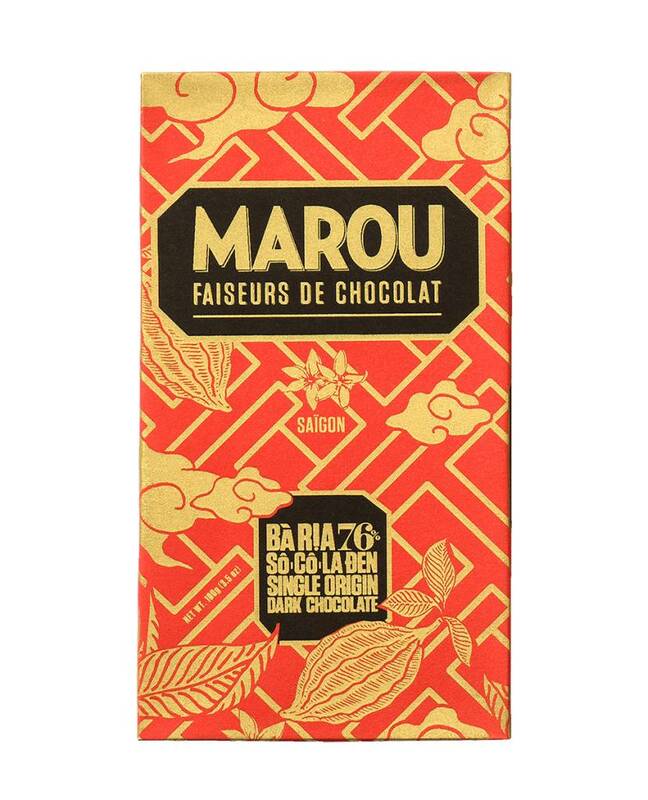 Marou, Chocolate Makers, is the story of Samuel and Vincent, two French who decided to leave everything behind to settle in Vietnam. Why? The desire for change! Fed up with the daily train train. The two men meet at a camp in the jungle of Vietnam. Seeking a new life project, they come to think that cocoa may well grow in Vietnam, nobody really exploits it to its true value. They decide to buy a few kilos of cocoa beans, and after working the product with a gas oven, the result is already incredible, they knew they were holding something. 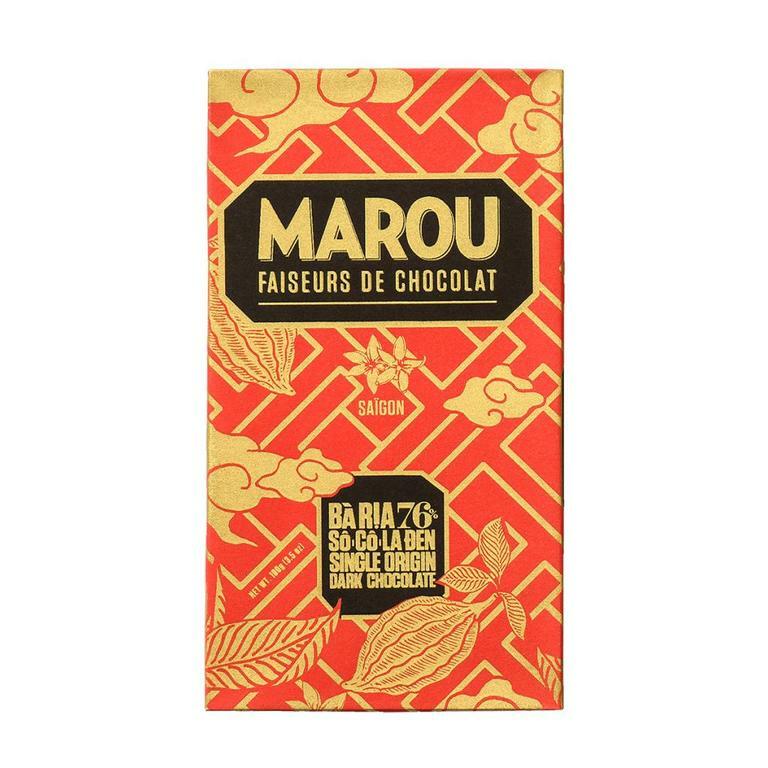 The two friends then embark on the project to create a unique chocolate, a chocolate Made in Vietnam, chocolate Marou, an exceptional dark chocolate in the original packaging. Samuel and Vincent work with farmers all over Vietnam, taking care of cocoa production, together they organize the production and the harvest before the product is processed from the bean to the tablet by their team of locals. Ingredients : Cacao Beans, cane sugar, cacao butter. This 100% cacao chocolate is full bodied with spice and juicy red berries, and its high cocoa butter content makes for a very creamy and mellow experience. This cacao thrives at the foot of lush forested hills in Vietnam's central highlands. Lam Dong Province's cool mountains yield a mild chocolate, but look alive for traces of prune, raisin and espresso. An intense and balanced chocolate with notes of coffee, softened by the roundness of coconut milk. A very healthy milk chocolate, lighter than a traditional milk chocolate. A good treat for the body and the mind! An intense yet perfectly balanced chocolate, from the Ben Tre province in the Mekong Delta, where cacao trees are planted among the coconut groves.